Here's a quick, easy, and no-fuss side that would be welcome alongside any grilled carnage. 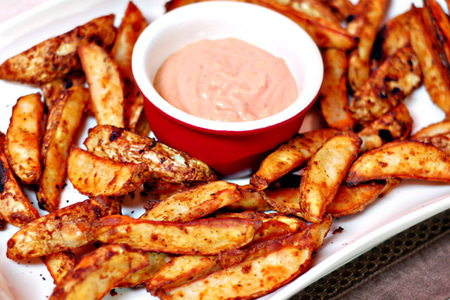 Not only are these simple, but they are a hearty and relatively healthy alternative to regular fries. Wash the potatoes, and dry them with paper towels. Cut each potato in half lengthwise, then cut each half lengthwise into three equal wedges, and put them in a large mixing bowl. Add the oil to the mixing bowl, reserving one tablespoon. Toss the potatoes in the oil to coat them. Combine the barbecue seasoning and corn starch in a small bowl, and mix well with a fork or small whisk. Add the seasoning and corn starch mixture to the bowl and stir the potatoes to coat them evenly. Oil a large lipped sheet pan well with the reserved oil. Pour the potatoes on the oiled pan and arrange them so that they each wedge is sitting on the skin side (cut sides up). Bake for 45 minutes, or until the fries are golden brown and crispy. I served mine with homemade fry sauce. Oh Yeah! You had me at "mojo"! Looks awesome. Fry sauce looks yummy too! I'm not sure I can ever go back to regular fries. These are amazing! I've already passed this recipe around to friends!